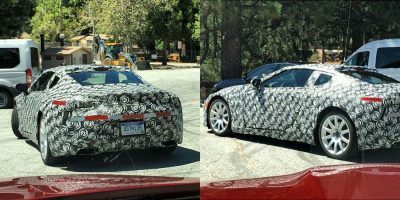 Spy Shots: Lexus LF-LC Production Prototype Spotted! Discussion in 'Lexus Lounge' started by krew, Jul 28, 2015. Den, RAL, Gecko and 1 other person like this. Please tell me this is a dream?! Finally! krew and OlFius like this. Honestly my whole day is made seeing this! Lexus said something along the lines of "we plan on keeping the production very similar to the concept" and so far they stayed true to their word. The shape, the taillights, the side window, etc are very LF-LC like. I cannot wait to see it without that camo! krew and RAL like this. I remember them saying they would bring 90% of the concept to production ... looking good! At first I was like, nah this isnt... No, this isn't the LC. Then I looked again and again and again. Noticed the taillights and it is the LC! I really am excited that the LC is coming soon, like real soon! Wish he got a picture of the front though. With so much hearsay, glad to see a drivable prototype...was scared that it wouldn't be more than a concept vehicle just for the shows. This will be the most-exciting Lexus product since the release of the LFA, which went on sale over 4 years ago now. When i first looked at that pic, i thought it was an aston martin. Looks really promising! Does anyone hope for a LC F? I can only wish LFA chief engineer Horuhiko Tanahashi is working on this car. It is not an LFA successor, but even if it is 70% as good as an LFA, it will be a great car. I agree! The current Lexus drive trains are quite outdated compared to what the German competitors are offering. This huge coupe needs a turbocharged 3.0L V6 as entry, a turbocharged 4.0L V8 with 400+ hp as range-toppers and a high-output 4.0L V8 with around 550hp for the F-model. WOW! Finally! It has been a long 43-month wait for all of us, since the first LF-LC teasers and leaks were shown in December 2011. Too bad they've copied by Youxia in the meantime. Likely the new modular platform delayed it significantly. Considering that the design was frozen in the first half of 2014, I'm not sure why it took so long to see any functional prototypes testing, let alone test mules in stretched RC or chopped LS-bodies. The LC500 is likely a 5.0 litre V8, but below might actually sit the upcoming 3.0 TTV6. Lexus will likely never see another 4.0 litre V8. Den, Lexus Cohen and OlFius like this. I wouldn't mind seeing BMW's 3.0L twin turbo L6 under the bonnet though; that's one great engine. But I seriously hope that the LC500 is not the 5.0L V8 found in the RC-F. It's an "ok" engine, but wouldn't be enough to propel this beast. If Lexus wishes to enter the super-coupe war with this, they need a coupe that is fast, I mean really fast, handsome, handles well and super luxury. Otherwise, it's just gonna be a normal premium-brand coupe, instead of something that competes with the S-Class coupe.